You know fall has arrived when pansies are on the tables at Johnson’s. These tough little plants have become a welcome addition to fall landscapes in Kansas. Pansies come in all colors ranging from pastel watercolors to black and are available with the familiar pansy “face” or in clear solid colors. Blooms range in size from tiny one-inch blooms all the way up to the large four-inch Super Majestic Giants series. Pansies prefer cool and cold weather. When planted in the ground in the fall, pansies will overwinter to -20˚. When temperatures get below 10°, the plant will go dormant. Blooms usually reappear by February and with very little care you’ll have pansies through the spring … so you’ll enjoy blooms in the fall, winter and spring! Violas look like small pansies and are the ancestor of modern pansies. Violas and pansies both may be planted in the fall for three seasons of color and are planted and cared for in a similar manner. Plant pansies in a sunny, protected, well-drained location. 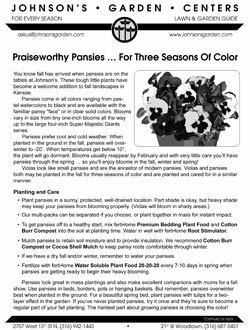 Part shade is okay, but heavy shade may keep your pansies from blooming properly. (Violas will bloom in shady areas.) Our multi-packs can be separated if you choose, or plant together in mass for instant impact. To get pansies off to a healthy start, mix ferti•lome Premium Bedding Plant Food and Cotton Burr Compost into the soil at planting time. Water in well with ferti•lome Root Stimulator. Mulch pansies to retain soil moisture and to provide insulation. We recommend Cotton Burr Compost or Cocoa Shell Mulch to keep pansy roots comfortable through winter. If we have a dry fall and/or winter, remember to water your pansies. Fertilize with ferti•lome Water Soluble Plant Food 20-20-20 every 7-10 days in spring when pansies are getting ready to begin their heavy blooming. Pansies look great in mass plantings and also make excellent companions with mums for a fall show. Use pansies in beds, borders, pots or hanging baskets. But remember, pansies overwinter best when planted in the ground. For a beautiful spring bed, plant pansies with tulips for a two-layer effect in the garden. If you’ve never planted pansies, try it once and they’re sure to become a regular part of your fall planting. The hardest part about growing pansies is choosing the color! 1. Choose a location that gets full or part sun. 2. Dig the entire bed area to about 6" deep. Mix Hi-Yield Bone Meal, Dutch Bulb Food and Cotton Burr Compost into the soil. 3. Plant your bulbs about 4-6" deep and 6-8" apart. Cover the bulbs lightly with amended soil. 4. Remove the pansies from their pack and plant between the bulbs — about 6" apart. Plant multi packs as a single unit or separate plants if desired. Don’t worry if you plant pansies directly over the bulbs. The tulips will find their way up! Fill in around the pansies with the remaining amended soil. 5. Water the pansies and bulbs with ferti•lome Root Simulator to establish a healthy root system. 6. Apply mulch to help keep the soil moist and to protect the pansy roots during winter. We recommend Cotton Burr Compost or Cocoa Shell Mulch. 7. If the winter weather is dry, water pansies and bulbs at least once a month as long as the ground is not frozen. 8. Fertilize pansies with ferti•lome Water Soluble Plant Food 20-20-20 every 7-10 days in the spring when new growth begins.